Happy National Doughnut Day!! Great excuse to make these beautiful things! I love doughnuts and because of that I tend to avoid them because I seem to be able to rationalize eating 2 or 4 instead of 1. The thing about being a baker is after a while it’s hard to really enjoy normal treats. I can pass up brownies & cookies for days because they are something that I find super easy to throw together. Doughnuts however, that’s a whole other story. Until this recipe I had only made the kind of donuts you bake because quite honestly I sometimes fear yeast! I feel like it’s way temperamental and I am prone to user error and I just run but, I saw a post about yeast on King Arthur Flour and I was determined to rock out a yeast-ish treat & also it gave me another reason to use my dough hook! I decided to make them filled donuts for the most part because pastry cream is another one of my best pals. I am writing a separate post on the pastry cream & Blackberry compote so for now I’m going to omit those recipes. Each one of these fillings deserves their own post! You can find tons of pastry cream recipes all over google or Pinterest. Sometimes I just made vanilla pudding and that is all it takes but, you the creative type will improvise. A jar of blackberry Jam will be perfect if you want to go that route. These would be great with Strawberry or Blueberry Jam also! 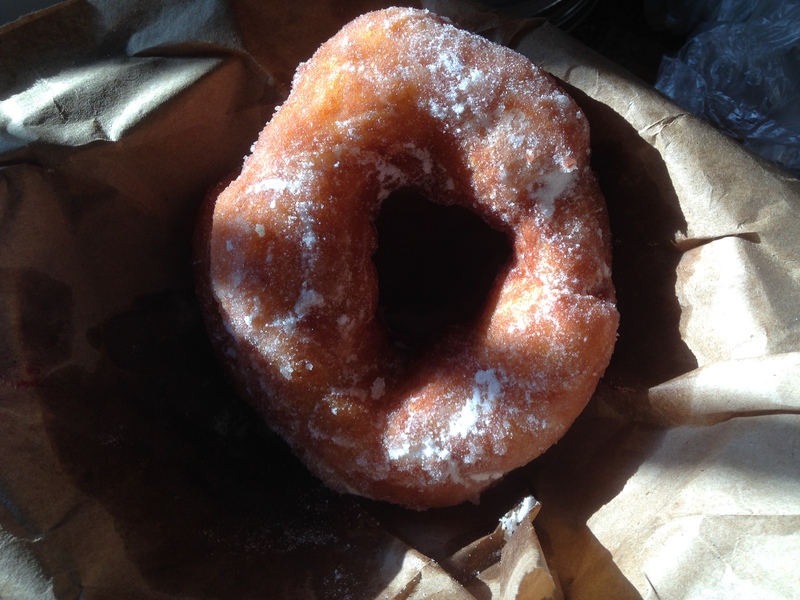 Here’s the thing though; As decadent as the filling sounds the donut is really the star here. They are change your life good & the small addition of lemon zest just makes them out of this world good. Don’t leave the lemon out even if you are cringing at the thought!! Sorry to those without a stand mixer; I don’t think you can make these without one. At the end of the day how perfect they look won’t matter. 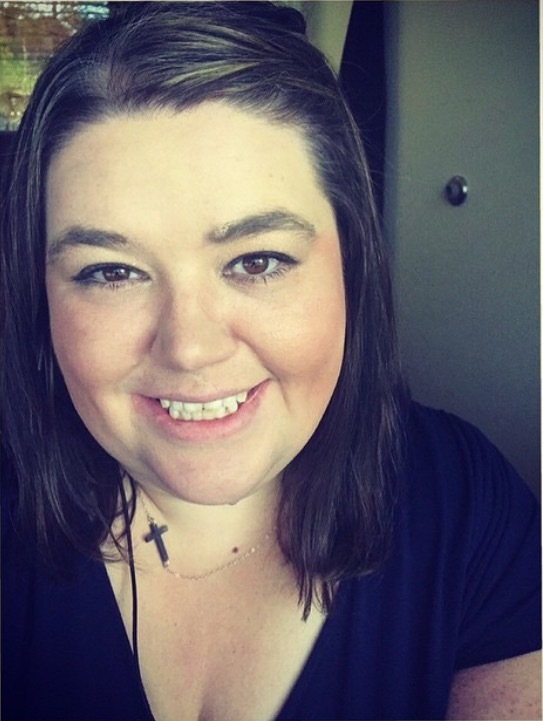 The ones who were less perfect I turned into middles and they were way better than anything I ever got from Dunkin Donuts or Krispy Kreme! Eat them right away for the best experience but, don’t worry these were good the next day also. If you have two cookie sheets use them both; One for the raw dough & one for the pan covered in sugar to dredge your beautiful yeasty donuts in! Don’t be afraid of these! You can do it and you will be so damn excited after you finish! With the mixer still running, add the butter piece by piece until it is all worked in and incorporated. There should be no visible pieces. This will take about 5-8 minutes just keep an eye on it. Scrape down the sides and then cover with plastic & let it sit in a warm place to rise until it’s doubled in size. Shouldn’t take more than 2 hours. 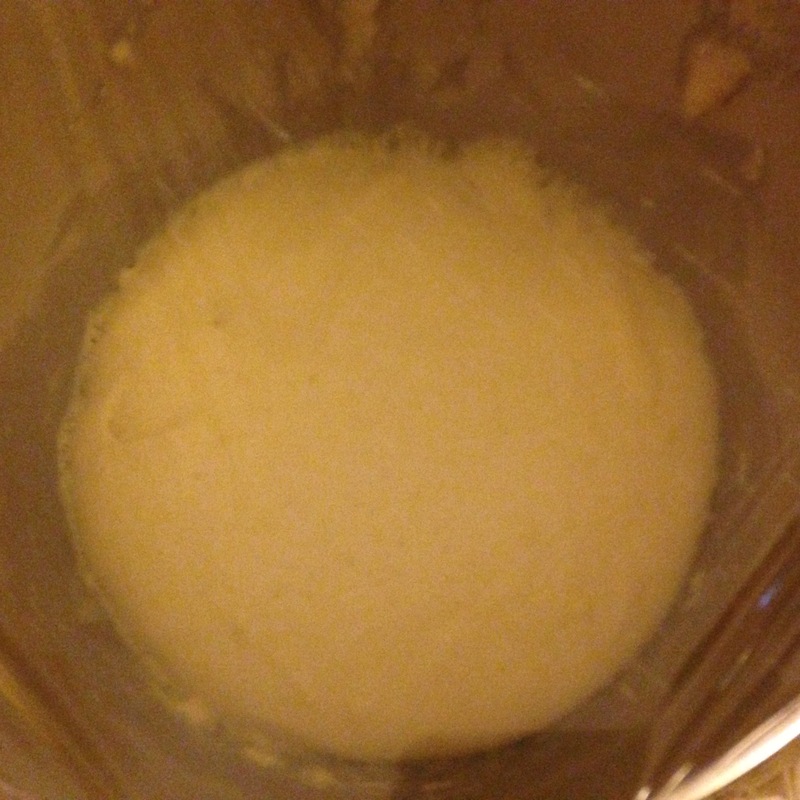 I use the rising time to make my pastry cream or and jam. I would work on whatever your plans are. 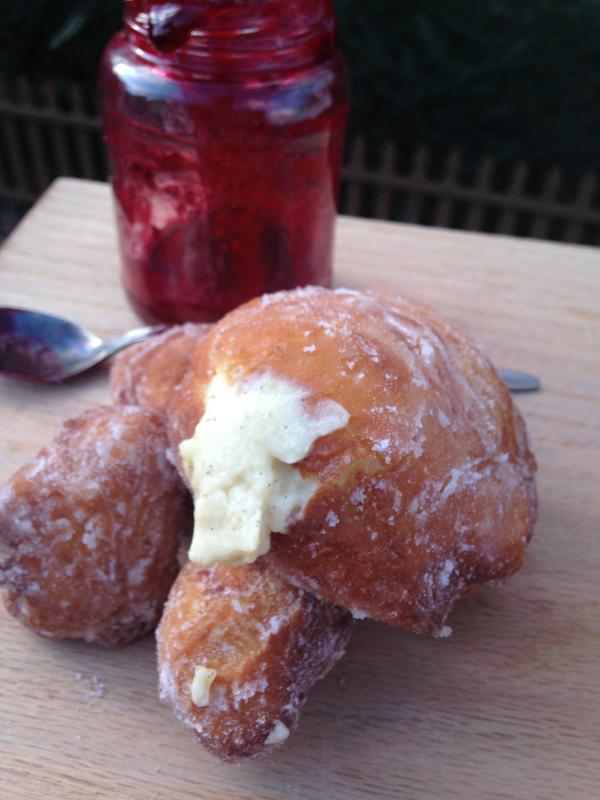 Taking the jelly out of its jar and lightly mixing with a knife will make it smoother for your donuts. The dough is pushing against the saran wrap after rising. When the dough has risen punch it down and scrape it out onto a well-floured surface; pat the dough into a rectangle, about ½ inch thick and cut out 9 donuts using a 2.5inch round cutter. Place the donuts on a parchment lined cook sheet. Cover with plastic again and set aside to rise for another 30 minutes or until puffy. They are honestly kinda fun to watch! 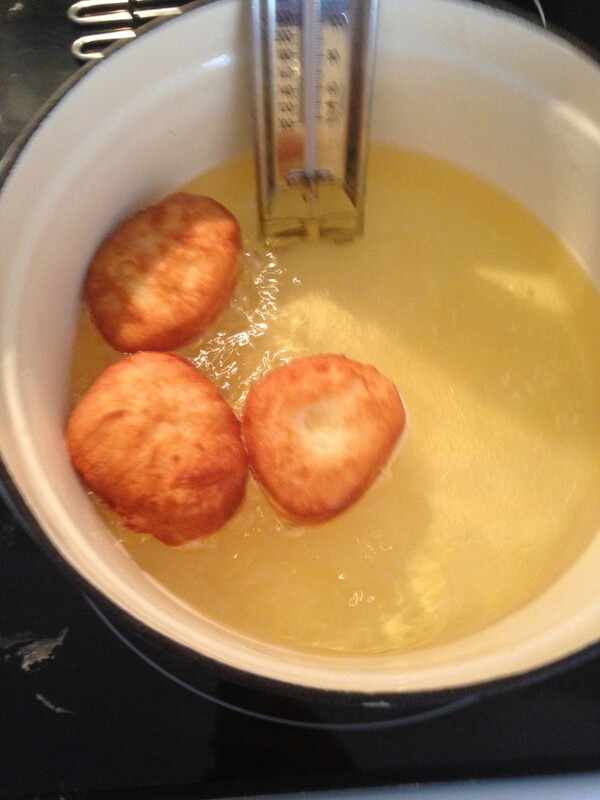 When the donuts are finished their second rise place about 2 inches of oil into a dutch oven or use a deep fryer. Heat the oil over ,medium low until it reaches 170C if you have a candy thermometer. If not I throw a small piece of the dough into the oil and wait for the bubbles to rise to the top. This means it’s ready to FRY! Add a few donuts at a time- making sure not to crowd the pan. 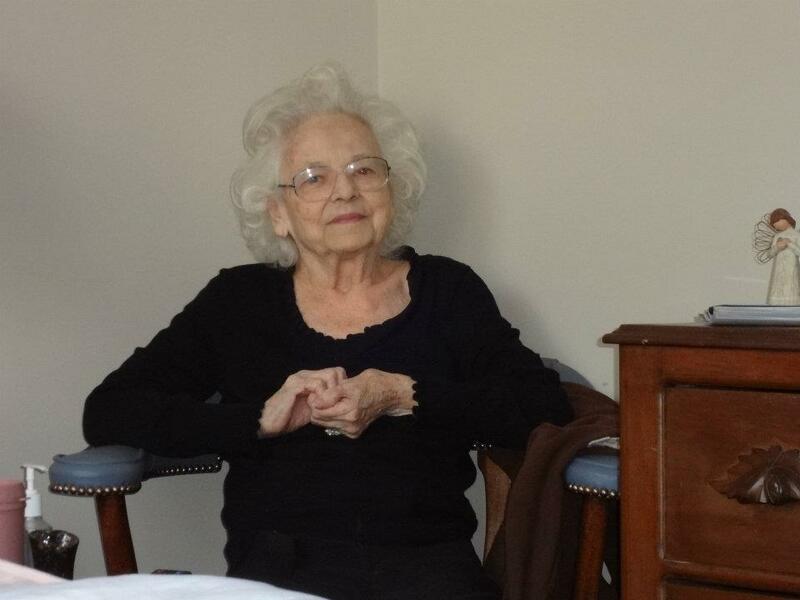 They will brown fairly quickly; About a minute or so on each side. 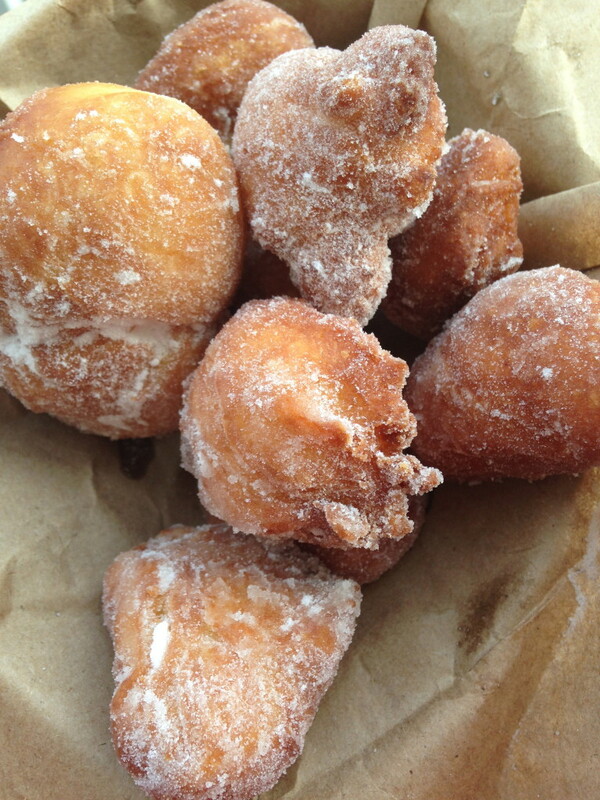 Oh my- as they float around the oil and become what you and I know as donut heaven my foodie heart is so excited! 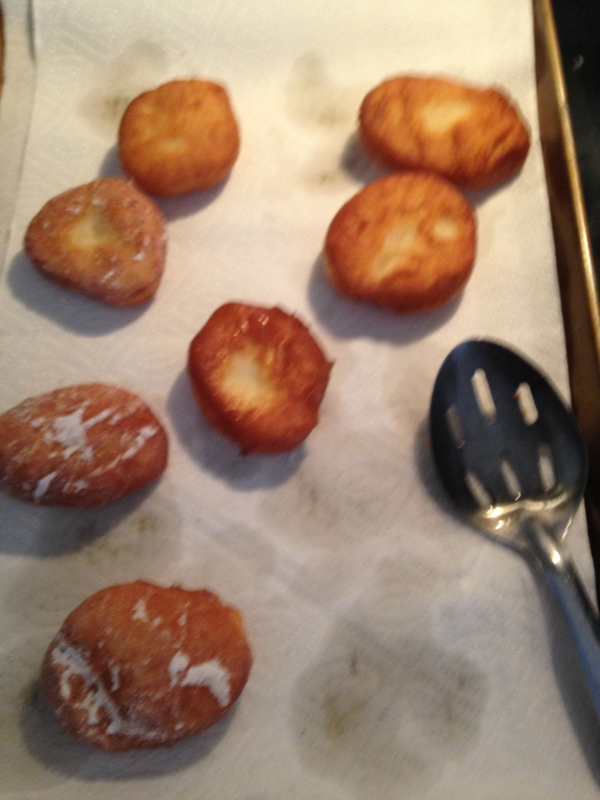 This was my first attempt ever at making fried donuts & they look perfect! 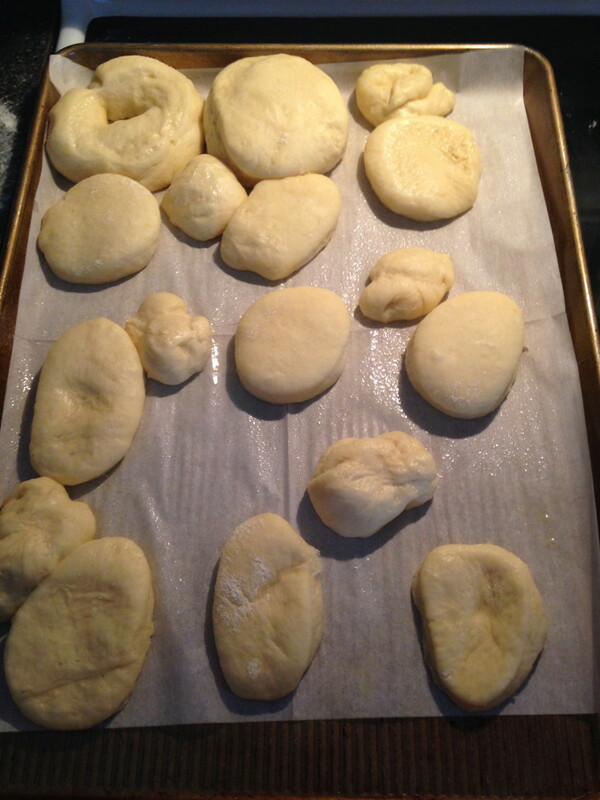 Drain the donuts on paper towels on your other cookie sheet but, not too long. You want them to be warm when you roll them into the sugar so it will stick nicely! Oh my these are smelling so good by now! I can hardly stand waiting to try them! Donut Holes AKA Ugly Dough pieces! Now it’s time to fill those babies! I use a piping bag and go for a tube thats no more than 1/4 wide. Insert the tube one end of the donut and squeeze until you feel the weight change and you are done! I filled some with jam & some with pastry cream & I loved every single combination. The oh so subtle lemony goodness in these really sets them over the top making them honestly the best donuts you’ll ever have in your own kitchen! 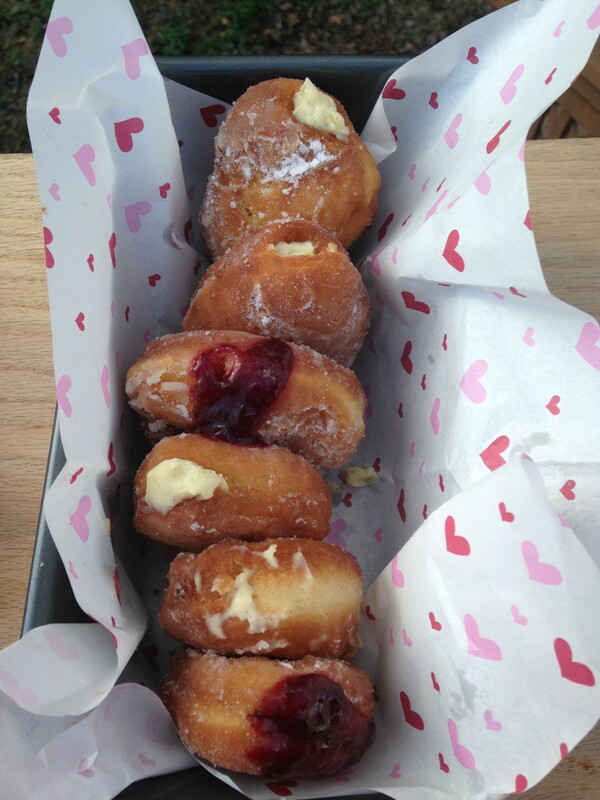 If you don’t stuff one into your face as soon as you finish I think we should revoke your foodie card! So I hope these will suffice for National Donut Day! I hope you’re gonna make these and tell me how smitten you are with them! If you just can’t stand to make your own try Dunkin Donuts, Krispy Kreme, or Sheetz today for a free semi yummy one! Start by fitting your mixer with the dough hook I so rarely use. (Shame on me) Pour in all of the ingredients except the butter. Work on a low speed for about 4 minutes, or until well combined and elastic. Scrape down the sides and then cover with plastic & let it sit in a warm place to rise until it's doubled in size. Shouldn't take more than 2 hours. 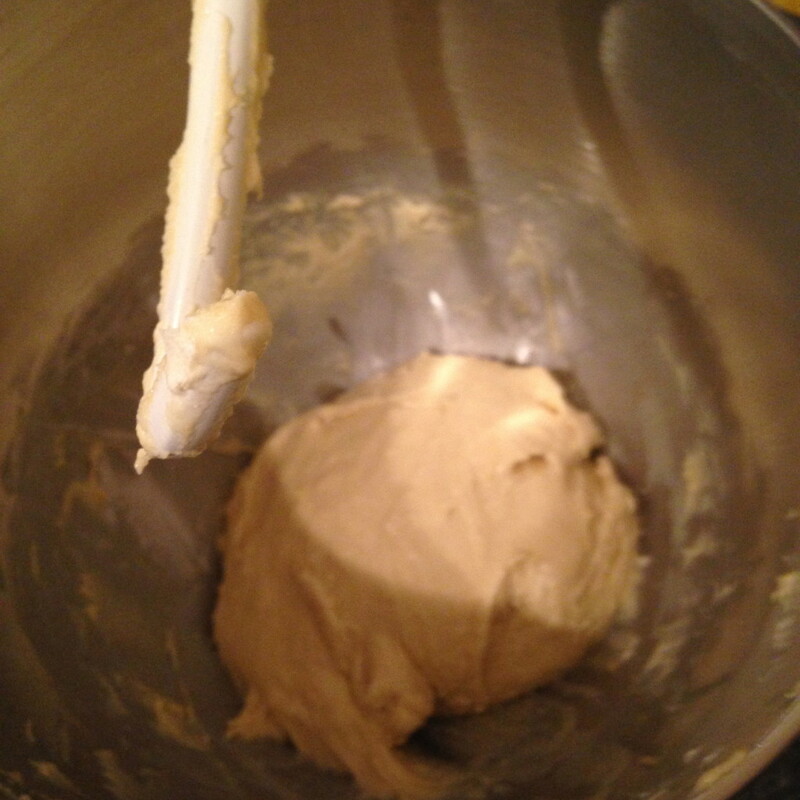 I use the rising time to make my pastry cream or and jam. I would work on whatever your plans are. 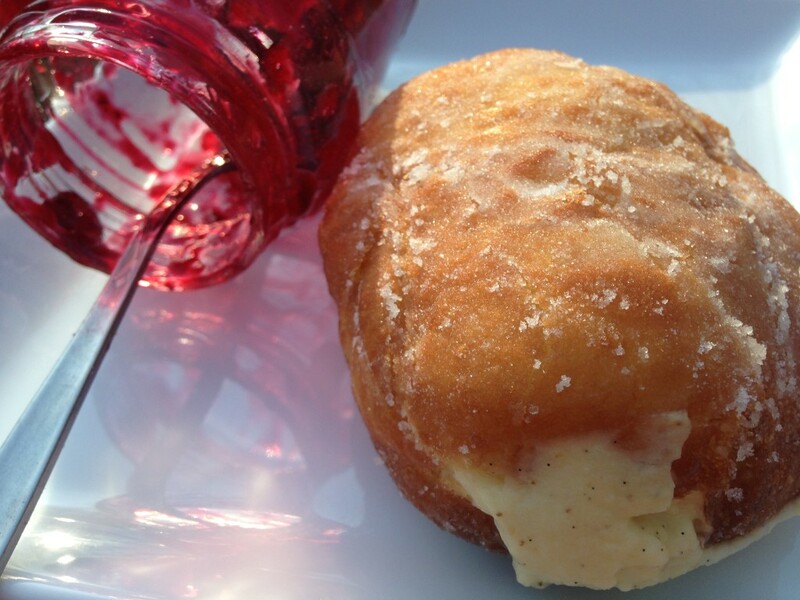 Taking the jelly out of its jar and lightly mixing with a knife will make it smoother for your donuts. When the dough has risen punch it down and scrape it out onto a well-floured surface; pat the dough into a rectangle, about ½ inch thick and cut out 9 donuts using a 2.5inch round cutter. Place the donuts on a parchment lined cook sheet. Cover with plastic again and set aside to rise for another 30 minutes or until puffy. They are honestly kinda fun to watch! 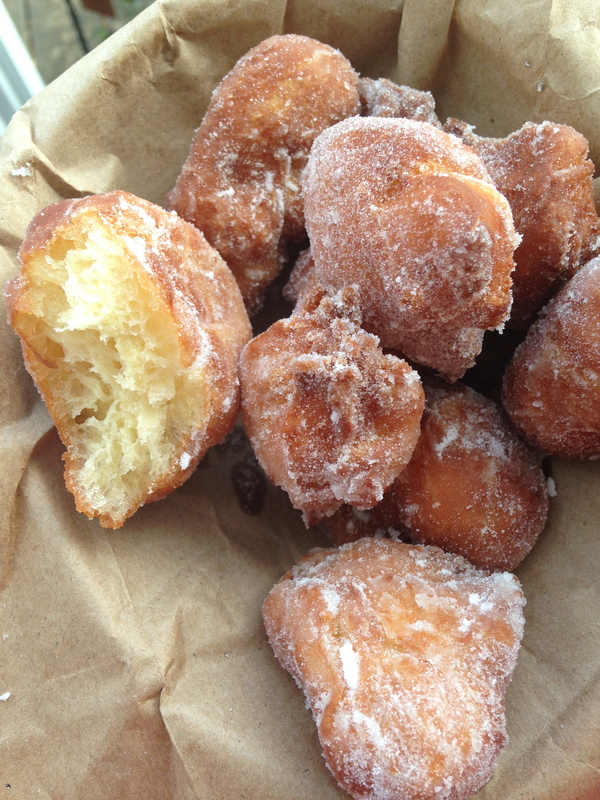 When the donuts are finished their second rise place about 2 inches of oil into a dutch oven or use a deep fryer. Heat the oil over ,medium low until it reaches 170C if you have a candy thermometer. If not I throw a small piece of the dough into the oil and wait for the bubbles to rise to the top. This means it's ready to FRY! Adding only a few donuts to avoid crowding the pan. They’ll brown fairly quickly; About 1 minute on each side. Move to paper towel lined sheet to drain. 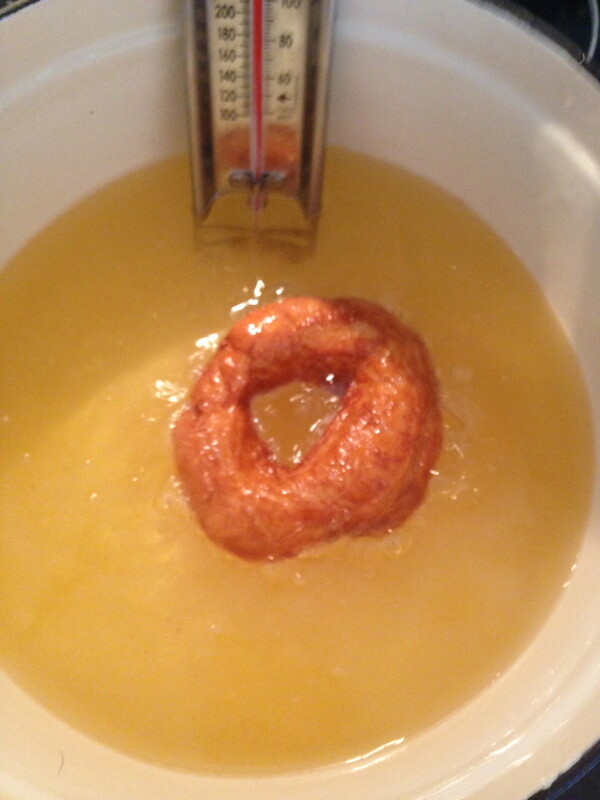 Toss warm donuts in the sugar. Using a piping bag & ¼ inch tube fill them until they start to get heavy. Eat them all ! ? This entry was posted in Baking, breakfast, brunch, Easy, Potluck, recipes, Uncategorized and tagged #baking, #berries, #blackberry, #blog, #breakfast, #brunch, #butter, #cake, #chevron, #chocolate, #donuts, #food, #foodblogger, #foodie, #friday, #goodness, #happy, #homemade, #instagram, #jam, #jenniferbakes, #jkbakingcompany, #june, #kaf, #kingarthurflour, #lemon, #love, #nationaldonutday, #nomnomnom, #pastrycream, #pinterest, #recipe, #sugar, #tgif, #thankful, #vegetarian, #yeast, #yum. ← 121 Calorie Crust-Less Veggie Quiche!